With the centenary of the Easter Rising approaching, the rush to bring out new books on the insurrection in Dublin in 1916 is reaching fever pitch. This book, a new illustrated history of the Rising, is mainly a photographic history of the event, with accompanying text providing an overview of the events leading up to the Rising – the Home Rule Crisis, the First World War, the formation of the Volunteers both in Ulster and in the south – and of the Rising itself. There is nothing especially new in the text, and as general histories of the Rising go, I would recommend readers first consult Charles Townsend’s Easter 1916, or Fearghal McGarry’s The Rising. The text has some research of interest on casualties but the main attraction are the illustrations. The research is diligent, but to the initiated fairly familiar. Perhaps limited space does not allow for detailed exposition of important points, for instance, the author remarks that ‘the prisoners were subjected to abuse by citizens of all social classes’ and leaves it at that. I would suggest that in fact the most violent verbal and physical attacks on the defeated insurgents were made by a very specific class – the poor of inner city Dublin, particularly the women, and of those the most virulent were ‘Separation women’ who had loved ones serving with the British forces in the Great War. There is some interesting research on casualties – indicating that civilian casualties may be far higher than we had previously thought – Glasnevin Cemetery, McNamara reports, buried 485 people, most of them civilians, as a result of the week’s fighting and dozens more were also buried in Deans Grange, Mount Jerome. So when the 63 insurgents who were killed (and another 15 executed) and 130 military and police deaths are counted we may be looking at death toll in Dublin city from the six days of fighting of over 700, not below 500 as has usually been stated. Here too though, the author approaches but then backs away from the really hard hitting conclusions. He mentions a case of Volunteers shooting hostile civilians on the first day of the Rising, but there are in fact many such cases. Similarly he alludes to the civilian casualties caused by the South Staffordshire regiment on North King Street, but does not explicitly explain that they, under orders from General Lowe to take no prisoners, took 15 men and boys out of houses on North King Street, shot them and hid their bodies in cellars. See here. The reader will not be misled by this book and it is fine as an introduction but there are probably more detailed guides to the Rising out there that flesh out these questions further. The extensive visual record of the destruction of Dublin city centre in 1916 is awe-inspiring. All that said, the point of this volume is to provide a photographic history and at this it excels. The images throughout are jaw dropping; from incredibly well defined photos of the Pearse boys as children, to the tightly packed streets of Dublin on the day of the Volunteers’ show of strength in 1915, to the boldly colourful British recruitment poster for the Great War to the savagely satirical anti-recruitment rejoinders from the separatists. The reader will find action shots of the Volunteers smuggling guns away from Howth in 1914 and a splendidly clear and well defined double page shot of the Grave side of O’Donovan Rossa where Pearse made his famous speech that ‘Ireland Unfree Shall Never be at Peace’. What will really stick in the mind, however are the photos of the combat and its aftermath in Dublin city. McNamara has obtained a photograph of the unfortunate Sherwood Foresters at Mount Street with dead and wounded strewn all over the road. We can see a burnt out tram used as an inner city barricade and the improvised armoured cars British troops used in the fighting. Hungry inner city boys queue up to be fed by nuns, dejected Dubliners walk through the ruins. It is the ruins themselves, the result both of the British artillery bombardment, looting and the great fire the two caused, that provide the most striking imagery. Views of Henry Street and O’Connell Street in ruins (in images this reviewer has not seen before) are both shocking and awe inspiring. A photograph taken from Nelson’s Pillar, where the Spire is today, shows the extent of material destruction on both sides of Dublin’s main street. Pages of pictures of burnt out and bombed building put this reviewer in mind of Syria and terrible death and destruction visited on cities like Aleppo, Damascus, Homs and Kobane in the past four years. It was a mercy after all that the fighting in Dublin in 1916 was over in one week. In short, this book’s text is not a bad general history of the Rising but it is well worth buying for its illustrations alone. Neil Richardson has previously published books on Irish service in the British armed forces in the two World Wars. Here he boldly and provocatively tells the story of Irishmen who fought in British uniform against the insurgents in Easter Week 1916. 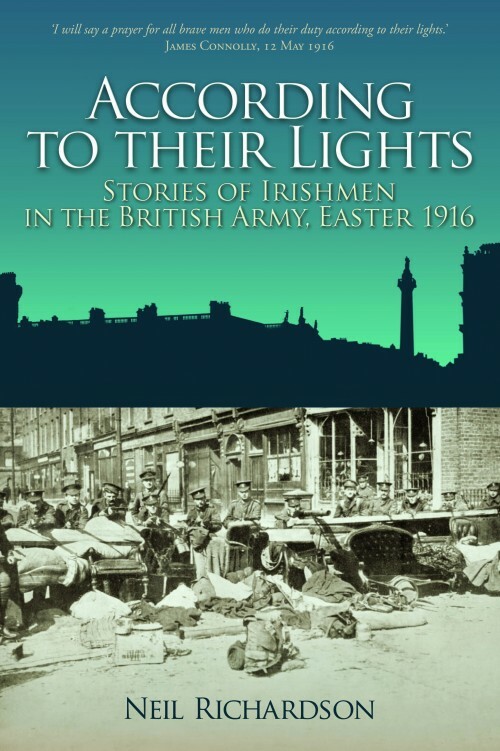 The title comes from a quote from James Connolly, the Citizen Army leader, shortly before his execution, ‘I will say a prayer for all brave men who do their duty according to their lights’. And so Richardson seeks to rescue from historical amnesia those Irish soldiers who served on the British side in Dublin in 1916. According to Richardson’s figures, nearly as many Irishmen fought to suppress the Rising as in it. It turns out that, according to Richardson’s figures that 1,000 of the roughly 16,000 British Army personnel who took part in suppressing the rebellion were Irishmen and so were 41 of their 117 dead and 106 of their 357 wounded. Another 17 Irish policemen were killed. These are significant numbers when we consider that the numbers of Irish Volunteers and Citizen Army fighters in Easter Week are estimated at about 1,500 and adding in Cumann na mBan and other unarmed activists about 2,500 going on pensions later granted. Between combat and executions 80 insurgents died. The insurrection of course happened at time when as many as 200,000 Irishmen were serving in the British armed forces in the First World War from the western front in France and Belgium to Salonika (today Thessaloniki northern Greece) in the east by way of the disastrous Gallipoli landings. Of these three units, the 10th Dublin Fusiliers, the 3rd Royal Irish Rifles and the 3rd Royal Irish Regiment, were on garrison duty in Ireland at the time of the Rising and were ordered to suppress it. Richardson recounts how three unarmed off-duty Irish soldiers were killed on the first day of the Rising when they stumbled across rebel positions. The Royal Dublin Fusiliers were first into action as an organised unit, on the first day of the Rising attacking the rebel position at City Hall which abutted the centre of British administration at Dublin Castle. Others fought their way along the South Quays, with particularly hard fighting st Sean Heuston’s outpost at the Mendicity Institute. Another Battalion, the 4th, used artillery to dislodge the Volunteers from their posts at the bridges over the Royal Canal at Cabra and Phibsborough before making their way to the city centre. The Royal Irish Regiment began by attacking the South Dublin Union, held by Volunteers under Eamon Ceannt and ended up as part of the force that besieged the insurgents’ headquarters at the GPO while the Royal Irish Rifles stationed in Portobello Barracks in Rathmines were involved in some of the fighting around Mount Street. In Portobello itself, an RIR Captain, Bowen Colthurst infamously executed without trial Francis Sheehy Skeffington and three other civilians. Perhaps the most interesting chapters – as they point to the divisions within Irish society – are those on the volunteer corps who fought on the British side. Perhaps the most interesting chapters – as they point to the divisions within Irish society – are those on the volunteer corps who fought on the British side. The first of these is the Irish Association of Volunteer Training Corps –nicknamed in Dublin the ‘Gorgeous Wrecks’ because of their advanced age and the badge on their uniforms GR – ‘Georgius Rex’ (George the King). This reviewer was aware that a unit of the GR was shot by Irish Volunteers on Mount Street as they made their way to Beggars Bush Barracks, but not of many of the fascinating details behind the incident. In Richardson’s book we learn that the GR was principally composed of middle class, middle aged professionals, there were pronounced links with the Irish Rugby Football Union (at that time Rugby was largely an upper class sport). More interesting still to learn is that many of their members were active in Dublin Orange Order circles and in the Dublin branch of the Ulster Volunteer Force, the Loyal Dublin Volunteers, who had stashed a significant arms dump on Rutland (now Parnell) Square. In the Rising itself the GR’s marched straight into an ambush with no means to defend themselves. Their rifles were unloaded and even once they got into Beggar’s Bush barracks they found that their obsolete weapons would not take the .303 ammunition for British standard issue Lee Enfields. Even once British reinforcements arrived with more weapons and ammunition the GRs had a torrid week, harassed by snipers and low on food. In Trinity College, long associated with both Protestantism and unionism, the Dublin University Officer Training Corps helped a motley collection of British Australian and South African soldiers defend the University. That the insurgents never took it was highly significant as it severed communications between their posts north and south of the river Liffey. This book will probably make many people angry, but that is no reason not to recommend it. The fact is that many Irish soldiers in the British forces did fight against the insurgents in Easter Week and this story deserves to be told. I do have some quibbles with the tone of the book though, which amounts to – the law abiding and decent followed Redmond’s call to join the British Army in 1914, Republican insurgents disturbed the peace and maliciously killed the forces of order. The Republicans are unjustly celebrated and the unfortunate Irish ex-servicemen forgotten. This is a story that deserves to be told but one need not agree with Richardson’s conclusions. First of all when we talk about violence in Easter Week itself, it seems unreasonable to expect the insurgents not to have fired on armed soldiers such as the GR or the Lancers who were ambushed on O’Connell Street on the first day. The rebels were not to know that the GR’s rifles were unloaded and naturally the GRs procured loaded weapons as quickly as they could. Secondly, while it is certainly true as Richardson writes that both sides committed both acts of kindness and acts of cruelty to civilians, most studies (see review above) agree that British forces were responsible for the large majority of the civilian casualties. Nor were they ever held to account for this, which included a significant degree of deliberate killing. The closest was Bowen Colthurst who was found guilty of the murder of Francis Sheehy Skeffington who was freed on the grounds of temporary insanity. We may blame, as many Dubliners did, the insurgents for visiting a battle on central Dublin but we cannot absolve the British Army of their part in the human cost of it. Finally Richardson argues that while only a small minority took part in the rebellion, up to 200,000 Irishmen served First World War. Quite true, but it was not a small minority that protested and joined a general strike against conscription in 1918 or who voted for Sinn Fein and independence in December of that year. 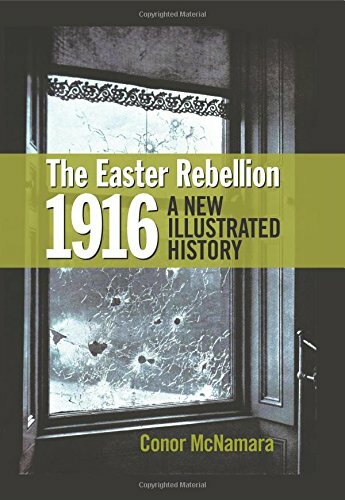 That said this book is a painstaking work of research, presenting a novel and provocative angle on the events in Dublin at Easter 1916. Written by: John_Dorney on 27 November, 2015.on 13 December, 2015.